TITLE: Muscle Milk Ready to Drink Protein Shake Spotlight "Cookies 'N Crème"
This month on MMACanada.net, our Staff of committed health-conscious individuals will talk about their experience using one of Muscle MLK ‘s ready to drink products. The flavour being reviewed this month is “Cookies ‘N Creme“. Everyone loves the real-life combination of Cookies and Cream, but does this drink live up to the hype? It sure does! Packed with 25g of high quality protein and only 160 calories, this drink is a MUST for all! Unlike most of the protein ready to drink shakes out there, Muscle MLK nails the taste dead on. After a solid workout, our staff enjoyed consuming Muscle MLK’s Cookies and Cream drink, and it helped tie over our appetites until we were ready for a solid meal. Muscle MLK products are an excellent source of antioxidant vitamins A and C, Vitamin D, calcium, magnesium and phosphorus for strong bones. Did we mention it is also Gluten Free? Muscle MLK is also suitable for those that are sensitive to lactose. 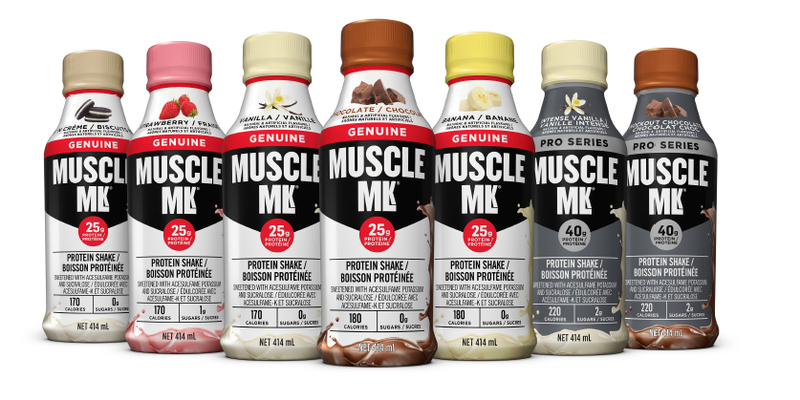 MUSCLE MLK Genuine Protein Shakes provide high quality proteins that are designed to keep your body in positive protein balance to help promote exercise recovery, provide sustained energy and help build and maintain lean muscle. Being educated is very important. You should care about what you put in your body, and you make every effort to understand ingredients, benefits and functionality. You recognize that protein isn’t just about muscles or intense workouts or something you only find at the gym. Protein is fundamental to help you live and perform better. MUSCLE MLK Genuine Protein Shakes provide all 9 essential amino acids, which the body is not able to produce, with an immediate and prolonged protein delivery in the body. For healthy muscles, protein is essential and the timing of your intake of protein is crucial. The goal is to keep your body’s protein supply at peak levels so you have available nutrients to maintain, repair and build your muscles. We promise you, that once you try Muscle MLK ready to drink beverages, you will be hooked, and not only just for the great taste, but for everything Muscle MLK has to offer! Head on over to Muscle MLK Canada today to learn more, or to purchase for yourself! News, Re-posts of everything MMA!, Welcome to the MMACanada Lifestyle Product Reviews!